TheGunBlog.ca — The Canadian Association of Chiefs of Police will lobby the government to pass new laws as it accuses licensed gun owners of supplying weapons to criminals, CBC News reported today, citing the chair of a committee on firearms. CACP names Regina Police Chief Evan Bray to chair Special Purpose Committee on Firearms. Other police have made similar claims without presenting any evidence. Available evidence suggests claims are false. The Ottawa-based association, whose activities include lobbying the government to restrict federally licensed hunters, farmers and sport shooters, named Regina Police Chief Evan Bray to lead its Special Purpose Committee on Firearms, CBC said. His comments suggest the panel has already decided what it will propose to the CACP board by a March deadline. Bray already knows that most firearms used in crimes in Saskatchewan are domestically sourced within the province. The task force is looking for legislative solutions. One it's already looking at centres around the fact that most criminals caught using firearms don't have the licence that's required to buy them, Bray said. What's happening is people with licences buy a lot of firearms and sell them illegally, said Bray — and the task force wants a system in place to track that. Bray and the CACP didn’t respond to an e-mailed request by TheGunBlog.ca for comment or for information to support the statements reported by CBC. Update Jan. 18 at 14:00 Toronto time: A link to Bray’s interview with CBC Radio Saskatchewan’s The Morning Edition couldn’t be found. Canada's entire "domestically sourced crime gun" meme is a trap. It's disturbing that so many politicians + police use it for anti-rights activism. It doesn't matter if it's 5%, 50% or 100%. We don't trample rights of Good People because of the presence of Bad People. Hunting and target shooting are among Canada’s safest and most-popular outdoor or sporting activities. More men and women have a police-approved gun licence than play hockey, baseball, football or who ski. Millions of unlicensed family and friends also shoot safely and responsibly under their watch. It’s illegal to buy, sell, have or transport any firearm without a licence, and doing so can land you in jail. Any new legislation would penalize only lawful shooters and continue to be ignored by outlaws. Crime with guns represents less than 0.5 percent of all offences in Canada, according to Statistics Canada. Many politicians and police have claimed “domestically sourced crime guns” and so-called “straw purchasers” are a rising threat to public safety, without providing evidence to back their assertions. The available data, almost all of which has been obtained through special requests by Dennis Young, suggest the claims are baseless or false, even after including the hundreds of guns that police supply to criminals through loss or theft. In Toronto, Canada’s biggest city and the base of its largest municipal force, the percentage of “domestically sourced crime guns” fell for the third consecutive year to a six-year low in 2017, and more than a third of so-called “crime guns” weren’t firearms, according to analyses of police data obtained by Young. The findings contradict what Toronto Police Chief Mark Saunders told the Toronto Star in 2016 and what other officers were reported as saying last year. Although several licensed shooters across Canada have been convicted or charged with illegally selling dozens of firearms, nothing indicates this to be a broad or rising trend among the more than 2 million men and women with gun permits. 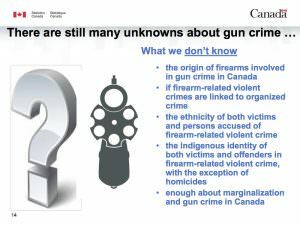 “What we don’t know: the origin of firearms involved in gun crime in Canada,” Lynn Barr-Telford, director general of health, justice and special surveys at Statistics Canada, said in her presentation to the National Summit on Gun and Gang Violence last March in Ottawa.